My family and I planned to visit Italy ever since we hosted a celiac exchange student from Rome, Giorgia (Jojo for short), for a school year. You wouldn’t think a country known for staples like fresh pasta, pizza and bread would be knowledgeable and accommodating when it comes to gluten-free cuisine. But you would be mistaken. Italy is a gluten-free haven, rich in phenomenal cuisine with a side of culture and history. Celiac disease has been diagnosed far longer in Europe than in the United States. Associazione Italiana Celiachia, Italy’s celiac support group, was founded in 1979. Dr. Alessio Fasano, responsible for increasing the diagnosis rate in the United States, is Italian and one of the world’s leading experts on celiac disease. Jojo was diagnosed with celiac disease as a child and grew up with her father and grandmother preparing fresh gluten-free pasta, bread, pizza and cookies. After hearing just how easy it is to find gluten-free cuisine in Italy, we crossed the ocean with visions of large plates of pasta layered with fresh basil, tomatoes and olive oil so flavorful you want to drink it from the bottle. Knowing that language wouldn’t be a barrier because Jojo speaks English, her lovely family welcomed us into their home and treated us to home-cooked meals I still dream about. They proved to be the perfect guides as we ventured in and around the gorgeous country with its long, rich history. Learning how to ask if something is gluten free in Italian is necessary and will make you feel more comfortable during the trip. Asking if something is “senza glutine” is met with not just understanding but concern. They will usually follow up by asking if you have celiac disease—something I wish happened more in the U.S.—instead of asking “allergy” or “by choice.” Being intolerant to gluten is not an inconvenience or a diet fad to Italians; it is a medical condition that gets their full attention. It is no surprise that the quality of gluten-free food in Italy is exceptional because Italians are very particular about ingredients. They also are very well informed on the ingredients in prepared dishes when dining out. Servers really know what they are talking about and will make recommendations based upon your preferences. Just as it does in the United States, food brings friends and family together, especially in a country where the family unit is close knit and children often live at home after finishing school. Visiting Rome isn’t all about the food—well, not completely. Taking a walk through the cobblestone streets is like stepping back in time. Everywhere you look there is a piece of history waiting to be discovered. Notable sights include the Pantheon, a former Roman temple that is now a church, and Trevi Fountain. The Trevi is one of the most famous fountains in the world, serving as a gorgeous display of Baroque art celebrating the sheer force of water—I can still hear the roar. Make time to experience the Colosseum, Rome’s largest amphitheater and most popular attraction; Circus Maximum, where the Roman chariot races took place; and the Sistine Chapel in the Vatican Museum—a long wait to get in if you don’t take advantage of any skipping-the-line opportunity by planning ahead, but totally worth it. Because I wanted to eat a gluten-free cheeseburger at McDonald’s (not available in the U.S.), we skipped Mama Frites and its gluten-free sandwiches, lasagna and tiramisu. I sprinted—OK, walked really fast—to McDonald’s to enjoy one of my favorite foods and places to indulge as a child. Orders are placed on touchscreens and picked up at the counter. The cheeseburger is premade, stored frozen, and heated and served in a sealed wrapper. It sits in a Schär gluten-free bun and, if heated properly, is beyond delicious—nostalgia at its finest. After lunch, head over to Pandali, Rome’s gluten-free bakery offering a selection of sweet and savory freshly baked goods. We opted for doughnuts filled with Nutella and fruit, but there were also hand pies, cookies, biscotti, brownies and an Italian version of a pop tart called rombo frutti. The baked goods are light and flaky like puff pastry and taste sinfully buttery. A selection of premade pizzas, sandwiches and flatbreads awaited those wanting to dine al fresco. Dinner that night was at Terra, a pizzeria with a separate room for preparing not one or two, but three types of gluten-free pizza crust from a combination of corn, rice, buckwheat and hemp flours. We ordered two different types of crust—bruschetta for an antipasto platter piled high with buffalo mozzarella, fresh meats and olive oil, and another for a pizza topped with thinly sliced potatoes, zucchini and fontina cheese. Salmon, pumpkin flowers, mushrooms, olives and prosciutto are among the popular pizza toppings available. Light and pliable, the crust can fold in half without cracking or crumbling. I was moved to happy tears, but somehow managed to save room for dessert—gelato at a local gelateria on a gluten-free cone. I am going to digress for just a minute to talk about gelato. It is not just a combination of milk and eggs; no, Italians have elevated gelato to an art form that should be enjoyed at least twice a day. Sample the flavors until you find one that intrigues you: Nutella (hazelnuts), pistachio, cream, coffee, dark chocolate, an array of fruity varieties and even vegan. Gelato should be made fresh daily and stored in metal tins, not white plastic ones, so don’t be fooled. If you happen upon a Grom, you have hit the gelato jackpot. 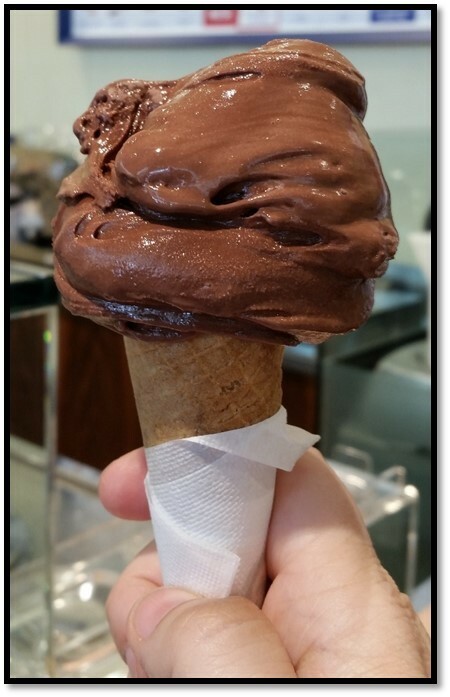 Grom is an entirely gluten-free gelateria serving cones, plain and with chocolate, nuts and sprinkles, cookies made from corn flour, popsicles and a rainbow of gelato goodness, all free from contamination. However, the best gelato we had during our time in Italy was at Vivoli, one of the oldest gelaterias in Florence. To find this little gem tucked away off the beaten path where the locals indulge, we had to ask for directions. Vivoli makes the most amazing decadently creamy gelato—and believe it or not, the very same treat also is available stateside at Disney Springs in Orlando, Florida. Finding real gelato in the States is more difficult than you think, so take advantage of this rare find next time you are in Orlando. do some shopping. Food shopping. Pop into a local pharmacy or grocery and marvel at entire walls full of gluten-free goods. In Italy, those diagnosed with celiac disease receive a monthly allotment to purchase food. Italy’s national health system recognizes that gluten-free food is incrementally more expensive and supplements the income of families with diagnosed celiac disease. Jojo’s family receives 90 Euros a month (roughly $95), and she says the money doesn’t stretch as far as you might think. Prices for gluten-free goods are surprisingly similar to those in the U.S.
L’Is La Celiaca, outside of Rome, is a gluten-free store where Jojo and her family shop. The rows upon rows of pasta left me feeling overwhelmed and annoyed by all of the pasta shapes—like bowtie, cappelletti and tortellini—that aren’t available in the U.S. And the freezers were overflowing with puff pastry sheets, tortellini and ravioli, breaded chicken, chicken pockets with prosciutto and cheese, pizza rolls, fruit tarts and so many types of bread. They even have a bakery where they make pizza and an array of traditional pastries. You may have heard of or even been to the store Eataly in the U.S., which has locations in Boston, Chicago and New York as well as one soon to open in Los Angeles. We visited one while in Italy, which offered everything needed to transform a run-of-the-mill kitchen to a typical Italian one—olive oil, pasta, pasta sauce, tomatoes and anything else you might think of. Get a scoop of gelato or a house-made coffee while waiting for an order of freshly sliced salami or prosciutto; sadly, there is no fresh gluten-free bread. To get a firsthand look at all Italy has to offer, hop a train and visit one of the many cities just hours outside of Rome. We scheduled time to visit Florence and Venice. Our favorite destination was Florence, where we saw the statue of David by Michelangelo at Accademia di Belle Arti. Purchase tickets in advance, unless you want to wait an hour or more in line. The Duomo, the main church of Florence, occupies the heart of the city and is breathtaking from any angle. If you are game, climb the Duomo’s more than 500 stairs to the top of its famous dome. Across from the Duomo you’ll find the Baptistery of St. John, where Dante and others were baptized. A trip to Florence’s dedicated gluten-free bakery Starbene is a must. It is a small family-owned shop with a display case lined with the most gorgeous pastries I have ever tasted. After gobbling down the black and white cookies and some pizza rolls, I really wished we had bought more to snack on the next day. The croissants filled with Nutella or fruit and topped with powdered sugar are sheer perfection. They also sell savory breads, calzones, sandwiches, whole cakes and some shelf-stable products such as cereal, pasta and crackers—and their prices are very reasonable. We grabbed a quick lunch at Mister Pizza in the Piazza del Duomo, where special attention is paid to preparing gluten-free pizzas. Choose your favorite toppings and in less than 15 minutes a freshly baked pie will arrive with a crust so light and pliable that you will be tempted to double-check its gluten-free status. Florence has a dedicated gluten-free restaurant, Quinoa, but we dined on pasta with lamb Bolognese, dinner rolls and tuna tartare on a bed of avocado with citrus glaze at the Golden View Open Bar just across the Ponte Vecchio bridge that spans the Arno River. Be sure to stroll along this historic bridge noted for the shops built right along it, where merchants display their wares, street musicians perform and time seems to stand still. For all of its scenery, Venice was less about food and more about the art. Upon arrival, splurge on a private water taxi; it is the best way to experience the Grand Canal for the first time. We first stopped in Saint Mark’s Square, where a trip to the top of its bell tower offers a spectacular view of the city. Patriarchal Cathedral Basilica of Saint Mark is located in the square and serves as the church of the Roman Catholic Archdiocese of Venice. When it came to choosing a museum, we opted for the Peggy Guggenheim Collection, which is displayed in the art patron and gallery owner’s former home. It features varied pieces, including handmade jewelry, wooden and metal sculptures, and paintings by Salvador Dali and Jackson Pollock. We headed to Antico Martini, one of the oldest restaurants in Venice, for dinner. 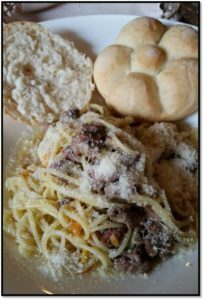 I chose the duck ragu with citrus served with Schär’s rosette dinner rolls. Although the food was excellent and the restaurant creates the perfect romantic setting, we had the worst service and at one point almost left. This is the only hiccup we had the entire trip, so I am chalking it up to not having a reservation. Italy is a fantastic destination for those dining gluten free. Whether or not you speak the language, there are many English-speaking Italians happy to ensure your gluten-free needs are met and exceeded. So what are you waiting for? Book the trip you have been dying to take and mangia, mangia!